Inspired, I took a quick flight to Chooch’s home country of Panama that very night to obtain a Chooch DNA sample. I managed to recover a saliva sample from some iguana bones that were picked clean from his favorite restaurant in his hometown of David. Living in South America has its advantages. One major advantage is the lax laws on human cloning. I immediately booked the next flight to a country that shall remain nameless, (rhymes with Olivia and CASH RULES). While there, I met a few mad scientists who were more than happy to clone me up my very own Mini-Chooch. I wouldn’t call Mini-Chooch a perfect clone. He’s about half the size of Real Chooch. He’s a little emotionally unstable, especially if the Phillies lose, or if I watch a Sixers playoff game over the Phillies game. He does love fried iguanas and can eat half gallons of ice cream at a time. Mini-Chooch has been very gentle with Baby Phan and Flyers Cat. He always tries to drink my beer, but I’m not sure exactly how old he is due to the accelerated growth hormones. He’s technically only 6 days old, but he looks like he’s in his 30’s. Mrs. Phan was leery at first, but she’s warmed up to him and she has been reading him bedtime stories with Baby Phan before bed. Mini-Chooch has been an invaluable resource since he can understand both English and Chilean Spanish. He can be really clingy. Last night, I signed Mini-Chooch up for his very own email. 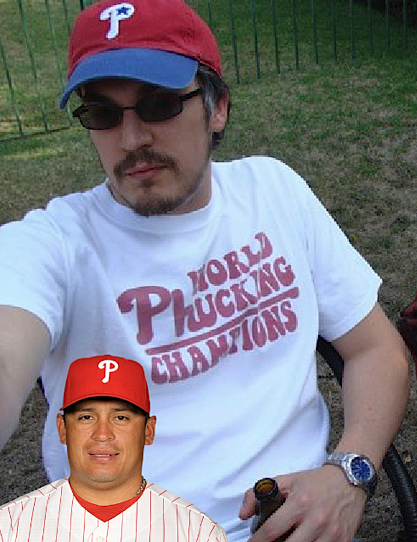 He was more than thrilled to be able to vote for Real Chooch for the All-Star game. When he hit his 25 vote limit, he insisted that I sign him up for 10 more accounts. He finally fell asleep at the computer after voting for 2 hours straight. Take a lesson from Mini-Chooch and vote for Real Chooch until you drop. Do it for all the Chooches both Mini and Real. This entry was posted in The Phillies and tagged Chooch, cloning, ice cream, iguanas, Mini-Chooch, Phillies. Bookmark the permalink. If I ever move back to the US, you can babysit Mini-Chooch. Well said! You’ve inspired me to do my voting tonight while I watch the game! Perfect! Be sure to vote at least 100 times a day. Thanks!